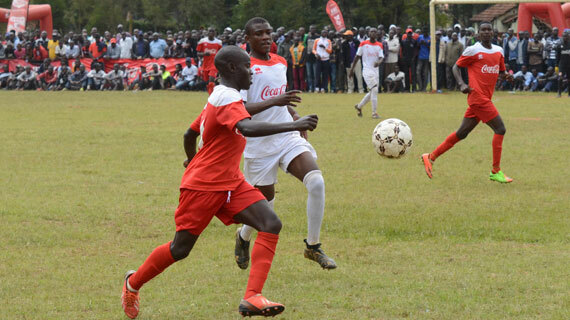 Thirteen time National Secondary School Games champions Kakamega High School will take on Nairobi’s Dagoretti High School in the semi-finals of this year’s showpiece after surviving a scare from Nyanza’s Ringa to qualify second from their group. The Green Comandos came into the final round of group matches with four points and needed just a point to go through while Ringa came in with three and needed a win to go through. Kakamega were on course after Kevinton Machika had given them the lead, but that comfort would soon be turned into some nervous moments when Ringa equalized through Aaron Nyagaka to send the fully packed pitch into frenzy. However, Kakamega held their nerves to ensure they progressed behind group winners St. Anthony. “It was a very tough match and credit to Ringa because they really pushed us. We are happy to go through and that is what was our initial plan. We will take on the semi with a lot of caution. Though Dagoretti is a new team, most of the players there were in Upper Hill last year and they beat us in the semis,” coach Brendan Mwinamo said after the match. Meanwhile, St. Anthony went through as group winners after a 2-0 win over Kathungi. They will square out with Olbolosat from Central who beat Tarbaj 5-1 to finish second in their group toppling Shimba Hills on goal difference. Geoffrey Onyancha scored from the penalty spot after Anthony Karabu handled inside the box to give the Solidarity Boys a 1-0 half time lead. Five minutes after the break, St. Antony took the game to safe distance with Moses Mudavadi’s well struck freekick. Meanwhile, the girls championship will have a new champion after holders Wiyeta were dumped out after being held to a 0-0 draw by Arch Bishop Njenga. The result meants Wiyeta finish the group at third while Kwale Girls finished second after beating Matuu 10-0. For Friday’s semi-finals, Arch Bishop Njenga will square out with Nginda Girls who finished second in the other group while surprise package Kwale will take on Nyanza’s Kobala. Nonetheless, Wiyeta will still have something to look forward to as their junior team progressed to the Copa Cocacola Under-16 tournament with a 100 percent record after topping the group following a 3-0 win over Alliance in their last group match. Maureen Awino struck a brace with Naomi Navalayo adding another as the girls from Nairobi booked a ticket to the semis where they will play Waa Girls from the Coast. Defending champions Olympic High School qualified for the semi-finals after beating Sega Girls 3-0 and will square it out with debutants Moi Girls Nangili who topped their group. In the boys edition, St. Anthony’s picked up their third consecutive 2-1 win of the tournament after coming from a goal down to beat Upper Hill. Te two sides though proceed to the semis with St. Anthony topping while Upper Hill finished second. The Solidarity Boys will take on Riyabu who finished second in the other group after a 2-1 win over North Eastern’s Sabunley while Upper Hill will take on St. Peters Mumias who topped their group after beating St. Cyprian from Eastern 4-0. Girls: Wiyeta v Waa, Moi Girls Nangili v Wiyeta.